undici artisti romeni nel campo del gioiello contemporaneo a livello internazionale, a Roma per la prima volta con il prestigioso magazine Autor come sponsor. For two days, on the 29th and 30th of September, the conceptual space at [myday-byday] Gallery (Via Luca della Robbia, 76) will host an exhibition featuring 11 Romanian contemporary jewelry artists, under the umbrella of AUTOR magazine. 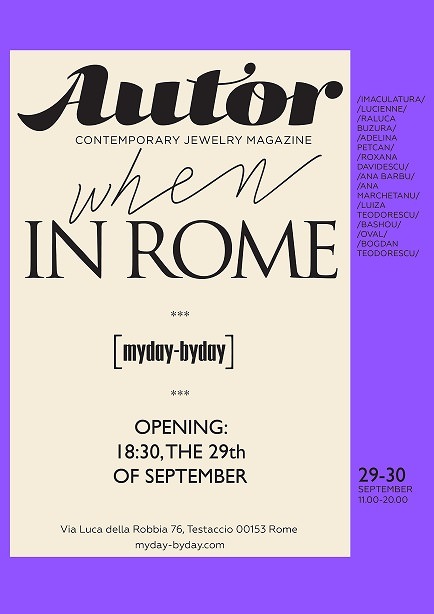 The exhibition AUTOR magazine: when in Rome… brings to Rome the creations of eleven of the most well-known romanian contemporary jewelry makers, explaining, through the larger context of AUTOR Magazine, a world of jewelry with an unexpectedly fresh message. The artists invited to showcase the jewelry at the exhibition at [myday-byday] space are: Imaculatura, Lucienne, Raluca Buzura, Adelina Petcan, Roxana Davidescu, Ana Barbu, Luiza Teodorescu, Ana Marchetanu, BashoU, Oval, Bogdan Teodorescu. ‘Whichever route you may take, remember this: all roads lead back to yourself. In terms of national heritage, Romania is a country in the process of self-discovery. For us, it is a game of connecting the dots, since we’ve always been on the forefront of mastery in the making of authentic designs. Romania has a fair weather, with four splendid seasons year-round, a wonderful scenery and is rich in contemporary jewelry artists with unique skills that complement themselves beautifully. We source our inspiration from the natural abundance of a culture firmly rooted in craftsmanship. The logistics our designers employ for creating authentic jewelry are secrets of the trade, admittedly. Yet there are also all these stories you would want to hear about everything else, right? 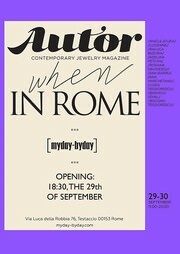 Join us for the opening of the exhibition ‘AUTOR’ magazine: when in Rome… on Thursday, 29th of September, at 6.30 P:M.